It really is astonishing that politicians are simply unable to understand simple projections like this. And it isn’t just the land requirement of course, there is the obvious environment disaster waiting at the end of life when it comes to disposal as well as the huge risk of fires during operation. There is a very common misconception that battery storage can solve the problems of intermittency arising from renewable energy sources. 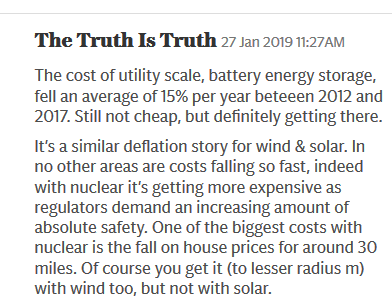 What the public at large, represented by Mr Truth, don’t seem to understand is just how limited the amount of energy that can be stored really is. As we know, Elon Musk sold his 100MW battery storage system to South Australia a couple of years ago. 100MW sounds impressive, but as his own specifications made clear the maximum output was only 129 MWh. And for this tiny amount of storage, the Australians paid an estimated A$150m, about £80m. The only way to increase this capacity is keep building more and more batteries.